In a 1993 lecture on the authenticity of Dante’s letter to Can Grande della Scala (see “A Polysemantic Country Song? ), Princeton Danteist Robert Hollander noted, “As far as Dante studies are concerned, a debated issue that has only a 174-year history is, relatively speaking, barely out of its adolescence.” He wasn’t kidding. People have been examining Dante and his work from nearly every imaginable angle for centuries—and producing a mountain of books to support their theories. The following short list mainly includes resources we used for this issue. Obviously an investigation of this topic must begin with the Divine Comedy, but which translation? That depends. Henry Wadsworth Longfellow’s is a classic. Dorothy Sayers’s has the best notes. Robert Pinsky’s (Inferno only) is probably the most accessible to a modern reader. Vita Nuova, Dante’s combination of poetry, autobiography, and writer’s workshop, brings the author to life. Il Convivio ("The Banquet") and De Monarchia ("On Universal Monarchy") explore his philosophical and political ideas. These are all readily available in print and online. 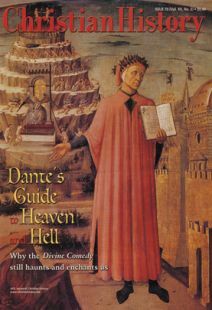 Robert Royal’s Dante Alighieri: Divine Comedy, Divine Spirituality (Crossroad, 1999) serves as a basic guide to the complicated poem. Kathryn Lindskoog leads readers through Dante’s Divine Comedy: Purgatory (Mercer, 1997) by retelling the story in her own words. Rodney J. Payton also aims for accessibility in A Modern Reader’s Guide to Dante’s Inferno (Lang, 1992). Geoffrey F. Nuttall takes the Comedy as the basis for warm, almost devotional, commentary in The Faith of Dante Alighieri (SPCK, 1969). From Hell to Paradise (Washington Square, 1996), by Olof Lagercrantz, offers a breezy walk-through of the poem but questions some Christian ideas, such as a literal hell. From here, the thicket of Dante commentaries grows much denser. Sayers’s Introductory Papers on Dante (Barnes & Noble, 1969) goes beyond the generalist notes in her translation into specialist territory. Charles Williams’s The Figure of Beatrice (Faber & Faber, 1943) yields profound insights into Dante’s thoughts on divine love, but it’s a demanding read. In The Invention of Dante’s Commedia (Yale, 1974), John G. Demaray highlights images and ideas—especially the concept of pilgrimage—that influenced Dante’s writing. Joan Ferrante takes a different approach in her influential The Political Vision of the Divine Comedy (Princeton, 1984). A reader can find basic—though occasionally contradicting—information on the poet in a variety of sources, including Dante and His World by Thomas Caldecot Chubb (Little, Brown & Co., 1966), Dante Alighieri, His Life and Works by Paget Toynbee (Methuen & Co., 1900), and Dante and His Time by Karl Federn (Haskell House, 1970). Hollander’s “Dante: A Party of One,” which appeared in the April 1999 issue of First Things, is also a nice introduction. Dante becomes the subject of deeper inquiry in books like Deborah Parker’s Commentary and Ideology: Dante in the Renaissance (Duke, 1993), James Collins’s Pilgrim in Love: An Introduction to Dante and His Spirituality (Loyola, 1984), and Erich Auerbach’s important Dante, Poet of the Secular World (University of Chicago, 1961). To get a feel for Dante’s milieu, one can start with Charles L. Mee’s well-illustrated The Horizon Book of Daily Life in Renaissance Italy (McGraw-Hill, 1975) or Margaret Oliphant’s quirky The Makers of Florence: Dante, Giotto, Savonarola and Their City (Burt, 1897). For more serious study, see A History of Early Renaissance Italy, from the mid-thirteenth to the mid-fifteenth Centuries (St. Martins, 1973) by Brian S. Pullan or The World of Dante (Clarendon, 1980), edited by Cecil Grayson. A devoted reader with a large travel budget (or a vivid imagination) could follow the route proposed by Anne Holler in Florence: Four Intimate Walking Tours (Holt & Co., 1982).